Chronic fatigue syndrome is a debilitating illness that, as of yet, has no cure and barely any effective treatments. While no home remedies can provide a miraculous cure, they may be able to help make symptoms more manageable. Although more research is needed before knowing how effective these natural remedies for chronic fatigue are, they have been shown to improve symptoms in the studies performed so far. NADH, which stands for “nicotinamide adenine dinucleotide (NAD) + hydrogen (H),” is a compound that naturally occurs in the human body. It is involved in several processes in the body, including the chemical process that generates energy. 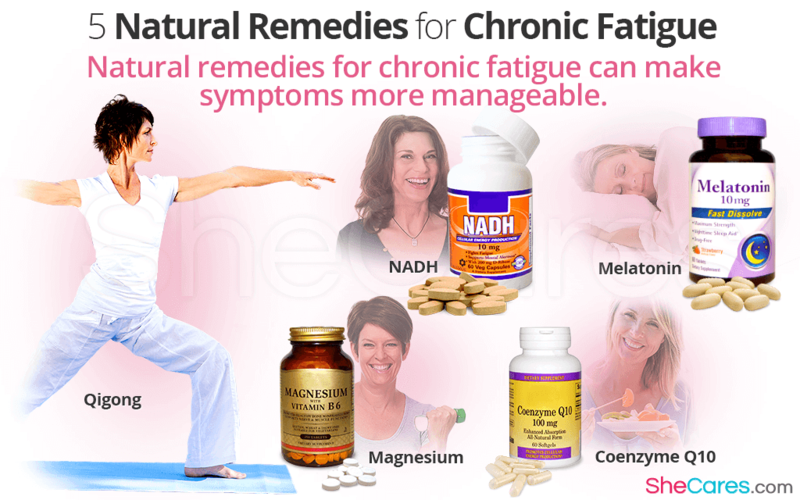 For this reason, people take NADH as a supplement for improving energy and alertness, including as a fatigue remedy. A hormone produced naturally by the body, melatonin is crucial in regulating the sleep cycle. Increased levels of melatonin help to prepare the body for sleep as well as to improve the quality of REM sleep, which is necessary for restful sleep. Taking melatonin supplements when you have chronic fatigue syndrome may help you sleep better, which could help reduce your fatigue levels. Magnesium can help to improve energy levels in the body as well. While this supplement has been shown to be most effective for people with a low level of magnesium, it may still help those with more normal levels of magnesium, as well. There are various uses for magnesium, including several uses that improve heart health, but one common use is increasing energy. It is not only used by people suffering from chronic fatigue; athletes often use magnesium to increase their energy levels as well. Coenzyme Q10 is found in nearly every cell in the body because it is crucial for cell survival - it is one of the compounds that convert food into energy. By taking CoQ10, the body may be able to increase its energy production because there will be more CoQ10 available for the process of transforming food into the needed energy. Unlike the supplements on this list, qigong is a Chinese practice that is meant to provide a holistic method of improving health. It is similar to tai chi in that there is focus on breathing, body posture, and meditation. While the Buddhist philosophy behind qigong is to reach a higher awareness, the gentle exercise it provides can help those with chronic fatigue to slowly improve their tolerance for exercise and reduce pain, which can help them to begin to return to their daily routine. To learn more about other ways to manage chronic fatigue syndrome, read about the best diet to reduce the symptoms of chronic fatigue. What are alternative treatments for chronic fatigue?